The Small Projects Foundation has now been operating for 31 years since 7 January 1988. The Foundation has been a major contributor to development in the Eastern Cape over this period with specific emphasis on identifying critical constraints and establishing pilot projects, and later replicating these pilots into programmes that become self-sustaining. The Foundation has always emphasised that development needs to be measurable, whether in terms of asset creation or the results of training and capacity building. 1) Information about the available options. 2) Training in deciding on options, in taking up the opportunities/projects and in the technical skills necessary for project implementation. 3) Support in implementing projects/options and in post-project operations and maintenance. All programmes and projects of the Foundation are built on this fundamental axiom of helping individuals, groups, communities and organisations who have the necessary commitment to grow and develop. To this end the Foundation operates on a request basis and always has a ‘sunset clause’ specifying that it will withdraw after a specified time. · Head Office in East London. 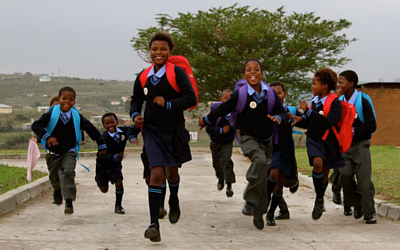 · The Foundation operates in most regions of the Eastern Cape Province and SA. · The Organisation is a community development and training trust, which is tax exempt under Section 10 (1) F, is registered for VAT and is a Public Benefit Organisation, PBO No. 18/11/13/791 and NPO No. 000-319 NPO. · The Organisation is an accredited training contractor with the Department of Labour. · The Organisation is an accredited training institution with the Services SETA. · The Organisation is structured so as to maintain direct project control by the communities, funders and the Foundation. · Through networked communication, financial and training systems, we bring the collective resources of the Organisation to a specific programme or project. · Small Projects Foundation is an accredited agent for the One-Up Business Training Course, which is accredited by the Services Seta. For 31 years the Foundation has demonstrated its willingness and ability to initiate many projects and ensure their success. Crucial developmental issues are decisively and effectively addressed. Success in entrepreneurial development, agriculture, housing, water supply, ecotourism, educare and capacity building projects shows an ability to identify issues and causes, and develop programmes that directly impact the needs of the poor. The Foundation was set up by an endowment fund. Incomes from the invested trust funds deliver support for some of our monthly operating costs. This ensures that at least 85% of project funds are directed at project costs, with the remaining 15% used for project development management, transport and other disbursements. The Foundation’s projects and programmes have received the support of, among others, the European Union, Royal Netherlands Embassy, Rotary Club of East London, Transnet Mobile Health Care Unit, Kagiso Trust, District Councils, the National Departments of Co-operative Governance and Traditional Affairs, Environmental Affairs and Tourism, Eastern Cape Department of Health, Canon Collins Educational Trust for Southern Africa, ABSA and Barclays Banks, Kistefos AG of Norway, One to One Children’s Fund, Johnson and Johnson, Elton John AIDS Foundation, Proctor and Gamble and Medicor . The Foundation has 9 Trustees at present, who head the Organisation. The Managing Director is delegated the responsibility to manage all the activities of the Trust under the oversight of bimonthly Board of Trustee meetings. Management of the investment of funds is guided by the Foundation’s financial advisors, National Finance Brokers. Development of District HIV/AIDS competence is the priority area of work. 1. Priorities for Local AIDS Control Efforts – A District Measuring and Response Tool. (Developed with MEASURE Evaluation). 2. High Transmission Area Management. 3. Community Based Organisational Capacity Development and Monitoring. 4. Training and Developing Community Home Based Carers (HCBC). 5. Stipend Management System for HCBC. 6. Wildfire (VCT role-play) Methodology. 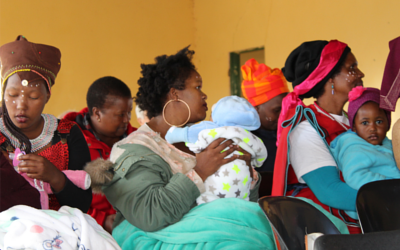 A programme of story telling and participatory methods in Educare Centres and rural villages for primary health care, agriculture and community building has been piloted successfully in 25 villages in the Eastern Cape. Amatola District Council: The Foundation was appointed as Project Co-ordinator to 6 Districts in the Transkei area developing Community Centre projects. These districts are Centani, Nqamakwe, Butterworth, Willowvale, Idutywa and Tsomo. The Foundation was appointed by the Presidential Project Team to assist in Flagstaff and Bizana with local economic development. The Foundation was appointed to facilitate the National Public Works Programme in the Eastern Cape and has managed the Dwesa, Willowvale and Ndabakazi Clusters. The Foundation was involved in the Spatial Development Initiative on the Wild Coast especially in terms of setting up Infocentres for the information, training and support of communities and entrepreneurs at each of the five anchor project areas. Hiking Trails: Strandloper Hiking Trail. Former Transkei and Ciskei: Numerous opportunities for Ecotourism, infrastructure and Infocentre projects have been developed with communities in the Eastern Cape. Projects operating are; Dwesa Cultural Centre, Market Parks at Willowvale and Ndabakazi, smallholder agricultural projects at Willowvale, Dwesa and Ndabakazi. East London: Nahoon Point Nature Reserve. King Williams Town: King Williams Town Tourism Development, Dimbaza and Amathole Heritage Sites Project. a) Small business - One-up Business Training Programme. d) Integrated development planning for Bizana and Flagstaff. e) Rural savings and co-operative societies. The Foundation has assisted in developing 3 pioneering housing projects involving more than 3 000 beneficiary families. The Foundation develops local contractors and subcontractors and local labour to do the work. These projects have been very successful i.e. Sinebhongo Village (a single mothers village), Potsdam Housing and Dimbaza South. The Foundation has developed water projects for more than 60 villages (± 58 000 people) in the Eastern Cape and has developed successful programmes for operations, maintenance and revenue collection with these communities. The Foundation has been involved in training and social marketing on sanitation in some 26 villages in the Eastern Cape. The Foundation has pioneered a methodology for training adults (and children) in skills and literacy. It has recently initiated a pilot project in 10 Educare Centres in the Eastern Cape teaching skills and literacy to mainly women and some men and trained 265 teachers (in formal schools and organisations in this methodology. 54 CBO’s mentored, trained and capacitated in the Eastern Cape. Set up Regional Educare Council and mentored for 5 years. 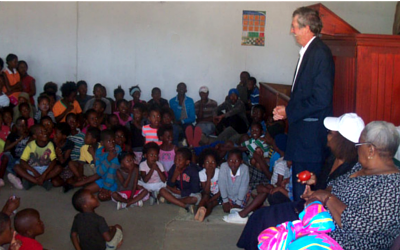 Assisted in building of 451 Early Childhood Centres with communities in the Eastern Cape. Mdantsane Greening 2,154 families and 25 schools assisted with gardening. The Small Projects Foundation has helped create 7 purpose built organisations to meet specific developmental needs in the Eastern Cape Province and Africa. The first, Khanyisa Early Childhood Development Centre, has engaged very successfully in training Educare Supervisors throughout the rural areas of the old Ciskei. This operation will now receive a yearly subsidy from the Eastern Cape Government and will be able to continue with its work. 493 Educare Supervisors trained to date. The Amatola Finance Corporation was formed to provide micro-loan finance to low-income people in housing, micro-enterprises and education. It has helped more than 16 000 borrowers and became financially viable. Renamed and taken over as part of the African Bank. Regional Educare Council was formed to assist poor children to obtain access to Educare facilities and has assisted more than 2 500 Edu-care centres providing care to more than 32 000 children throughout the Province. Strandloper Ecotourism Board was formed to develop ecotourism along the Eastern Province coastline and has developed the Strandloper Trail, which has become self-supporting and was voted the best summer hiking trail in South Africa. The SPF Infoshop Company was formed to provide information, training and support to poor people throughout sub-Saharan Africa. Sinebhongo Village has been formed to develop housing and a safe urban environment for working mothers and has completed housing for 100 single mothers and their families. Paediatric AIDS Treatment for Africa (PATA) was formed to provide support to treatment teams across Africa, to provide prevention, treatment, care and support combat HIV/AIDS in mothers and their babies. This organisation supports and trains 495 treatment teams in 26 African countries (doctor, nurse, pharmacist, counsellor and expert patient) to treat over 100 000 children and their carers. The Foundation has also been a leading organisation in capacity building of community leadership and entrepreneurs to enable them to develop water supplies, agriculture and housing for their communities. SPF has assisted 493 communities/community interest groups in raising their quality of life economically, physically and socially. 7.2.22 Strandloper Ecotourism Board Training of 22 Coastal Guides. Assisting in the Development of Ecotourism Facilities, marketing and operations and maintenance of the Strandloper Hiking Trail. In the last eight years, the Foundation has been fortunate to have been involved in numerous community driven projects. Through this involvement, we have built up considerable experience in what is a new approach to infrastructure and community development. This has led to us offering the following training and services to communities and community based organisations in order that they achieve sustainability in their development. Ability to deliver within budget and to comply with stated objectives. The Foundation is well placed to provide and develop affordable, accessible and sustainable programmes and projects for poor people in the Eastern Cape Province and beyond. The challenge is to begin to develop the ability to do this throughout South Africa and Africa in the next few years. We offer key skills and learnings to assist government and funders to identify needs, develop programmes in participation with all stakeholders (especially rural communities) and monitor and evaluate such programmes.